I posted the picture of my clafoutis and now, as promised, here is the recipe. 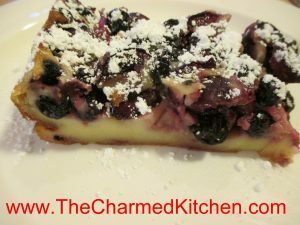 So what is clafoutis? Clafoutis is a sort of pancake, sort of custard, sort of quiche. It is a lovely dessert for fresh fruit, for sure. You can serve it plain, or topped with powdered sugar. I like to serve it with a scoop of ice cream on a hot day. I used a combination I thought would make a nice dessert for the 4th of July. Blueberries and raspberries would work as well.